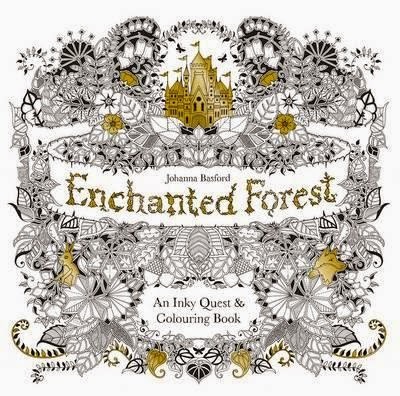 Almost a year ago, I had the pleasure of reviewing Johanna Basford's Secret Garden Inky Quest and Colouring Book, and it was love. This latest in the Inky Quest series is just as gorgeous. A book of extraordinary detail, this is far from your ordinary activity book. With pages drenched in natural woodland settings--with everything you can imagine, from blackberries, toadstools and spiderwebs, to nests, castles, tree houses, telescopes and secret doors--this is a magical meander of creativity. Pages can be used for colouring, yes, but they can also be pored over and marvelled at. The author also invites readers to seek out and find a range of objects (a key is found in the front of the book), and also hidden in the book are nine symbols carved into square tablets. These unlock the castle door at the end of the quest. I wonder what you'll find inside?